Rev. Fr. 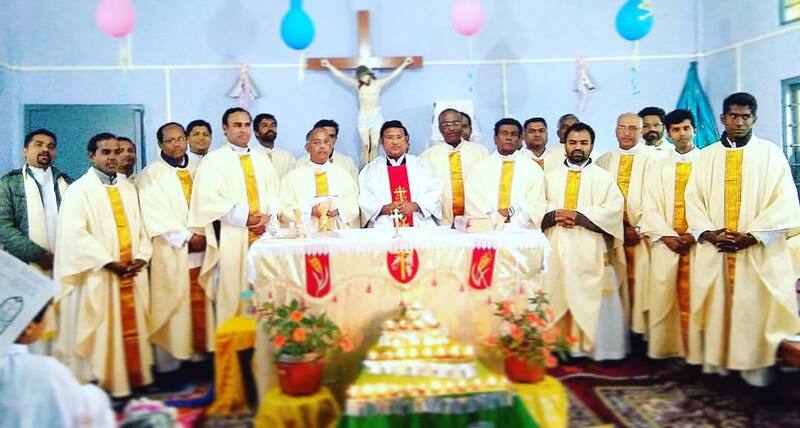 Paul Vilanguparayil celebrated his Silver Jubilee of Priestly Ordination on 11 February 2017 in a solemn concelebrated Holy Mass at Dambuk, the last mission station of Miao Diocese. Fr. Paul, who has served the Diocese of Miao in various capacities including that of of being the Financial Administrator, marked his 25 Years of Priestly Ordination. He is our first diocesan Priests to celebrate Silver Jubilee. Currently working in Dambuk Mission, he has served in many centres across the Diocese during his 25 years of Priestly life. To mark this important occasion, Fr. Lijo, the co-pastor at Dambuk, organized a fitting celebration for Fr. Paul. The Vicar General of the Diocese of Miao, Rev. Fr. Jose Chemparathy, representing Bishop George, congratulated Fr. Paul and wished the best for the years ahead.